Rehabbers Increase Profits with DAWGS! Time is Money – DAWGS Steel Security allows for safe and secure managed access to your properties. No Break Ins – Resulting in faster turnaround times, plus on time, on-budget projects. No Lock Boxes or Key Management – No need to coordinate keys and lock boxes with contractors and tradesman. DAWGS doors with a built-in 4-digit code solves this problem. No Stolen Tools and Materials – A secure property means contractors can leave tools and materials in the property in the evening. This reduces the time and cost of the rehab. No Safety Concerns – Real estate agents sell properties a lot quicker because they feel safe showing the property and are guaranteed reliable access with DAWGS doors. Contractors also feel a lot safer working in a secure property. If you have a vacant property you need to secure, DAWGS has your solution. Get a Quote Now. Connie Brown lives in the Englewood neighborhood in Chicago, Illinois. Her home is next to a vacant property that is in the process of being renovated. During the months of renovation, the vacant boarded-up home was broken into on three separate occasions over a short 2-month period. The motive for the break-ins was burglary, burglary of appliances and building materials. The thieves took a furnace, a water heater and other building materials, primarily copper for resale. Mrs. Brown, living in such close proximity to these criminal acts, was concerned about her own safety and the security of her property and valuables. In Spring 2015, all of a sudden the break-ins to the neighboring property stopped. Pleased, yet curious about what caused the criminal activity to cease, Mrs. Brown walked next door to try and find out what had changed. She observed that the door and windows were secured with DAWGS steel door and window guards. She took down the DAWGS number, 877.88.DAWGS and went home. Once home, she called DAWGS and simply asked “What’s the Magic?” Bob, the representative at DAWGS who took the call was not clear what she meant, so he asked her to elaborate. She went on to tell him about the break-ins to the vacant property and how they suddenly stopped after the DAWGS guards were installed. Bob explained that DAWGS steel door and window guards patented design are impenetrable and that the coded door guards make it easy for approved contractors to come and go with ease. With renovations on her own house scheduled to begin, Mrs. Brown enlisted DAWGS to secure her property. Mrs. Brown commented on her experience with DAWGS “I could not be more pleased with the DAWGS products and customer service. 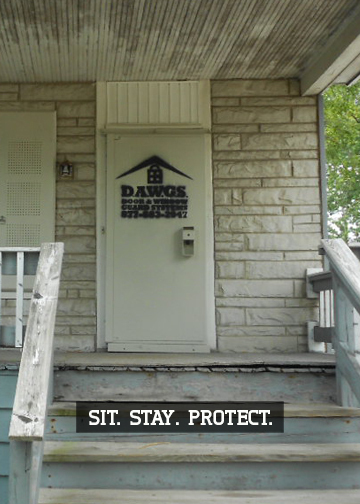 Not only am I confident that my property and valuables are secure, but the look and design of the DAWGS guards add curb appeal that a board-up solution cannot. I would highly recommend DAWGS for securing vacant property”. If you are in the business of emergency restoration, you know that one of the biggest challenges you face is managing the comings and goings of the multiple vendors you employ. If a vendor misses an appointment due to a key missing or a failed meeting, the entire project can be delayed, costing time and money. DAWGS has a solution to multi-vendor logistics headaches – coded steel door guards. DAWGS steel door guards feature a true 6-point locking system, just like a bank vault. The door guards are modular, so they can secure any size and shape, giving your vendors the freedom to come and go without worry. Unlike electronic doors that are susceptible to glitches and cold-weather freezing, the DAWGS unique mechanical design grants you and your vendors full access with no surprises. There are no hinges or handles, so the only people that can use this door are the people you give access to. DAWGS heavy-duty steel doors can’t be kicked down or broken, so once it closes the property is completely secure. Zee Kawa, of Zees Group (www.zeesgroup.com), a Construction & Disaster Restoration firm based out of Chicago notes “Using DAWGS door guards has simplified the job of managing access for multiple vendors to the properties we are working on. With this basic, yet often complicated logistic concern out of the way, we can get to our business of restoring property and speed turn around time for our clients”. A nationwide survey conducted by Auction.com, a leading online real estate marketplace, showed a continuation in January of a trend seen in the fourth quarter of 2014 – that of investors’ preference to flip houses rather than rent them out. It’s not exactly typical for some buildings to stay empty for years, especially when they’re in busy, bustling neighborhoods like Chicago’s Wicker Park, but that’s exactly what has happened with the storefront that was used to represent the fictional record store Championship Vinyl in the movie High Fidelity. The commercial storefront, located at 1514 N. Milwaukee Ave at the corner of Honore Street, was sold last month for $1.4 million to a venture called House Music LLC, a subsidiary of Newcastle Limited. Previously, Deborah Marie Peterson owned the building. The building was constructed in 1902 by Joseph Dercheimer and designed by architect H. Olgen. It’s a column-free space with 13-foot ceilings and a high volume of foot and vehicle traffic. In the heart of Wicker Park, just south of the busy Six Corners intersection, this corner retail lot sat vacant for several years. It’s surprising that the building stood vacant for so long, considering the development that’s taken place in the neighborhood over the past ten years. It’s categorized as a “contributing” building to the Milwaukee Avenue Landmark District. Boarded up for years is no condition for a landmark building. Still, that’s what it’s been thus far. Now that it has new owners, however, that likely won’t be the case for much longer. The coveted corner retail space does not yet have a tenant, according to Brennan Hitpas, the vice president of Newcastle Limited. He said, “We are believers in the neighborhood and like the fact that it is a corner location.” With no tenants secured yet, however, it’s essential for this building to remain protected until it can become occupied. Boarding up with plywood isn’t generally a desirable option, as not only are the boards flammable, but they don’t always keep crime out. A better option would be using steel door and window guards, which effectively secure doors and windows from anyone trying to break in and steal from, vandalize, or otherwise damage the storefront. It will be interesting to see what the storefront gets transformed into, but one thing is certain – Rob Gordon won’t be there to lament his relationship status. Late in 2013, Dominick’s made headlines after it announced it would close a number of Chicagoland stores. Since then, several different stores have taken over the locations, including Mariano’s, Caputo’s, and Jewel. Now, it’s been announced that Jewel will take over five more locations of the shuttered Dominick’s buildings. This new acquisition includes two city locations—one in Roger’s Park and one in Old Town. That brings Jewel’s total investment to nine new stores. The new locations announced to be converted to Jewel stores are at 1763 Howard Street and 424 W. Division St in Chicago, as well as 3 others in the suburbs – 3243 S. 115th St. in Merrionette Park, 800 NW Highway in Fox River Grove, and 345 S. Rand Road in Lake Zurich. The company has not yet said when the new locations will open, however. Jewel-Osco’s parent company, New Albertson’s, said that it is investing about $100 million in new projects and remodels for Jewel this year—more than 25 remodels are planned for 2014. Previously, Jewel took over and reopened four other Dominick’s locations—two in Chicago at 1340 S. Canal Street and 2550 N. Clybourn Ave., and two in the suburbs—one at 1340 Patriot Blvd. in Glenview and one at 142000 South Bell Road in Homer Glen. Though the turnover from vacant building to new store was very fast the last time around—with just about a week in between the announced purchase of the locations and the reopening as Jewel—there has been no word as to what the timeline is to redevelop these empty stores as new Jewel locations. If empty buildings are to be left vacant for any length of time, it’s ideal to secure the entry points so that trespassers or criminals cannot get inside. There are several ways to do this: one of the most effective ways to keep people out of a building is to block off all entry points. Boarding up windows with steel window covers and covering doors with a steel door guard system make it impossible to get inside. They can be left on while developers make plans for what to do with a space—which may be particularly helpful if Jewel is waiting to space out their renovations or remodels over time. In efforts not to burn through their remodel budget too early in the year, it’s possible that they’d allow some buildings to stay vacant for a longer period of time. Protecting building vacancies is easy with steel window and door guards. Call DAWGS today for more information.